The majority of TV wall mounts provide all-round features such as tilt range, TV size compatibility, weight capacity, etc. that differ from mount to mount and from most of the TV wall mounts we found, the Loctek R2L Curved TV Wall Mount emerged as the best TV wall mount on the market with domineering features and an excellent consumer rating. It offers an attractive way to display TV while providing easy movement and versatile flexibility. Locktek provides certified products with quality craftsmanship, impressive functionality, and unmatchable construction that puts this best TV wall mount at the uppermost position. You will find that this TV wall mount has got lots to offer that many other prevailing competitors don’t. It features an extension up to 19 inches with a built-in safety lock that is designed to keep your flat panel TV secure and steady. With this TV wall mount, you get two advantages: a 16 inch stud or a 24 inch stud. The Loctek R2L Curved TV Wall Mount is frustration-free certified with a well built and sturdy construction that is easy to assemble despite being a heavy duty gear. As indentified by our practiced analysts, the Loctek R2L Curved TV Wall Mount is an excellent bargain to move forward with that’s reliable enough to wipe those tears away from a wrong purchasing decision. It’s a good investment for a TV wall mount as it features a solid heavy-gauge steel construction and durable power coated finish that is capable to knuckle down both curved TVs and flat panel screens. It comes with a built in safety lock to keep the flat panel TV intact. The Loctek R2L Curved TV Wall Mount is also UL certified with 4 times the loading capacity and it can accommodate any TV size of 32 inch to 70 inch and VESA standard from 200 x 100 to 600 x 400. Its electronic features also include a slim profile that’s tilt-able with a cord slot runner. It’s a full motion TV wall mount with a 10 year manufacturer warranty. You won’t be disappointed with this one as it provides quality features with installation hardware tools to help you assemble it effortlessly. This UL certified best TV wall mount offers a complete package that will take you swiftly from the assembly part to the consumer satisfaction part painlessly. The next one is what our researchers like to call ‘the value-beast’ yet best TV wall mount on the market. On finding, you will come across many versatile TV wall mounts that are ridiculously marked down on price, but all offer primitive features. The Sanus VLF525-B1 TV Wall Mount can be a bit too harsh on its price, but it offers exceedingly superior features that’s beyond compare on the market to-day. Now you don’t have to make use of extensive tools to tilt, swivel and extend your TV to great levels anymore! It features individual swivel, tilt, and roll controls that also allow you to slide your TV from side-to-side for perfect elevation and flexibility. With a simple attachment step or just a ‘click!’ you can comfortably position your TV into place and experience great picture quality from wherever you watch. The Sanus VLF525-B1 TV Wall Mount is our extravagant yet valuable pick on the list of the best TV wall mounts because it fits TVs from 51 inches to 70 inches and can carry upto 125lbs loading capacity effortlessly. Having received commendable consumer ratings online, this best TV wall mount is made from quality materials to hold up much larger TVs to achieve a true 90 degrees angle, completely perpendicular to the wall: a control that’s unmatchable amongst other TV wall mounts on the market. The most dominating factor of this wall mount other than its price is that it provides painless comfort to viewers from any angle and with several assembly adjustments upon arrival you will notice that it’s the best deal to steal for your money. Also, the Sanus VLF525-B1 TV Wall Mount comes with installation hardware controls to guide you correctly during assembly and maintenance, if at all required. The Arrowmounts AM-P18B Articulating Wall Mount is an arm retractable wall mount designed for flat panel screen TVs of 37 inches to 60 inches. It’s the only one on the market that’s considerably affordable and more efficient than the crowd. With its solid heavy-gauge steel figuration and durable powder-coated black finish, this best TV wall mount is perfect to pick for when you’re on a tight budget. It also adapts to large flat panel screens and LCD TVs with an easy-to-assemble kit that includes mounting hardware and a user manual. It supports universal VESA mounting patterns and is suitable to hold much more than what one would expect from a budget friendly TV wall mount. It’s our best of the lot because it offers such impressive features that our expert researchers couldn’t overlook at all. The Arrowmounts AM-P18B Articulating Wall Mount is an articulating wall mount which means that it has a retractable arm attached to the wall bracket allowing a much wider range of motion. Contrary to popular beliefs, you can just as easily assemble a complicated TV wall mount without any hassle or the burden of calling for a professional to get it done for you. What are the types of TV wall mounts? Most TV wall mounts work well with all kinds of TVs such as LCD, LED, curved or flat panel screens. They also handle TV wall brackets that work for all measures of TVs and their powerful weight capacities. During the initial course of our research we found that there were few that stood out from the crowd in terms of the correlation between a TV wall mount’s price and its features. It’s easy to find a TV wall mount that’s compatible with majority of VESA mounting patterns, but it’s considerably difficult to find one that’s a suitable fit for you in terms of value and performance. While a TV wall mount is considered a secondary buy for most TV owners, it can really enhance your TV viewing experience to a whole new level, providing great flexibility and comfort at the same time. Making sure your TV is backed by the best TV wall mount will make sure your entertainment hub doesn’t fail you after a few months. Before buying a TV wall mount, it’s imperative to look at the mount’s specifications, VESA standard, ease of installation, help and support features to ensure that you’re buying the best of what’s out there. These are extremely flexible wall mounts that allow you to pull, swivel, tilt or pan your TV away from the wall and in different angles for perfect picture viewing. This ensures that you are able to view the TV from versatile angles without the added burden of using separate tools to adjust your TV levels from top to bottom and left or right. Full motion TV wall mounts are extremely durable because of its unique all-encompassing feature. It’s the most popularly preferred TV wall mount as well for all-rounder’s looking to buy something that’s powerful with comfortable control and requires less time at the handling. These are excellent to use for any mounting scenarios. These are capable of rotating up to a complete 60 to 90 degrees in either direction, they can be position anywhere from 5 to 20 inches from the wall, thus allowing maximum swivel controls, and can even tilt between 15 to 20 degrees to avoid any unwanted glare. Articulating wall mounts are popularly used in open spaces such as in the kitchen or living room to grant more flexibility in movement for users. These allow users to tilt the TV downward for the optimal viewing experience, especially for those looking to mount the TV higher than eye-level. Majority of tilt TV wall mounts offer a 15 to 20 degrees tilt control, which is ample for most mounting standards. Tilt wall mounts are popularly used in retail stores, boardrooms, restaurants, and even the bedroom where the preferred location of the TV is considerably higher up on the wall than most other spaces. The Loctek R2L Curved TV Wall Mount is our best TV wall mount pick on the market because of its impressive functionality and solid construction. It allows curved TVs or flat panel screens to extend, tilt, swivel between 3.3 inches to 19 inches from the wall, which is great if you want to arrange wires and cables effortlessly and keep the setup neatly organized. It weighs a total of 99lbs and is certified to accommodate 4 times, that is 396lbs loading capacity wonderfully. It guarantees strong performance as well as superb endurance with a universal hole pattern as well as side by side adjustment that is capable of mounting all kinds of flat panel screens and curved TVs. Made with heavy duty construction, this best TV wall mount has potentially raised the bar for other competitors in terms of manufacture and resistance. It is specifically designed for curved TVs, yet it has been complemented on by many consumers for its easy adaptability on flat panel TVs for several years. We also found that the Loctek R2L Curved TV Wall Mount can easily be adjusted according to your comfort levels, granting you more control and least limitations that are experienced by many similar TV wall mounts on the market. At an unbelievable market value, you won’t find any weak points in our best TV wall mount pick of the year. Given our reliable research, the Sanus VLF525-B1 TV Wall Mount is the only step up pick we would consider under any circumstances given its notable features and construction. It’s extremely flexible and forgiving and even though it has had a reputation of the being unmatchable in terms of market value, why would you compromise on quality before cost? With a steel figuration design, the Sanus VLF525-B1 TV Wall Mount features tilt and swivel capabilities to grant the ideal viewing experience as much as the flexibility of sliding and turning your TV from side-to-side to ensure correct picture quality. It can proudly display a flat panel screen TV of up to 125lbs from 51 inches to 70 inches. It comes with a mounting hardware and installation hardware to ensure smooth assembly and an owner’s manual to keep the user informed of its minute details. With its integrated decorative cover that keeps the hardware hidden for a better appearance, this best TV wall mount has got the complete package from assembly and mounting to performance to longevity while keeping the appearance in check too! Some might consider this TV wall mount as being beyond compare not only in terms of price, but also under the controls of performance, construction and presentation. The presentation of this product is quite sturdy and strong with maximum safety from common defects and it keeps those never ending cables under proper harness. Once installed, the Sanus VLF525-B1 TV Wall Mount is safe and promising under all factors even though it’s considerably more expensive than the rest. An articulating TV wall mount is one that offers board range of motion, hence greater flexibility and picture quality; and the Arrowmounts AM-P18B Articulating Wall Mount provides exactly that! Being a budget-friendly choice on the market, it has surprising features such as weight capacity, tilt range, and motion that you would expect from a considerably expensive mount. It is functional to the user’s wants and works great once assembled correctly. Although this TV wall mount requires professional guidance during assembly, but if you have sufficient knowledge of marking through odd openings, keeping the markings level, etc. the assembly won’t take much out of your time. If you’re looking for a mount that would grant you to place a 60 inches TV easily without having to check more money and effort on more complicated models bought from big brand stores, the Arrowmounts AM-P18B Articulating Wall Mount is your ideal match. It can be mounted on 2 studs which means it is extremely sturdy and reliable for several years and it also features long extending arms so users can mount their TVs on corner-sides effortlessly. You can change sides, angles, and rotate your TV from one side to another without any hassle or sudden irregularities. The best TV wall mount is one that not only secures your TV, but it also enhances the complete viewing experience. The Sanus Systems VMPL50A-B1 Visionmount Tilt Mount is definitely one to consider if you’re looking for a good TV wall mount that will grant you maximum flexibility at your optimal location. It represents modern technology height and leveling adjustments with an innovative rail design that allows the TV to shift left and right for perfect placement, even with off-center studs. This best TV wall mount also features Virtual Axis technology for smooth tilt motions with just the touch of a fingertip. It supports TVs of up to 130lbs and fits 32 inches to 70 inches TVs easily. Since it has got a universal mounting pattern, it comes with pro-set post installation height & level adjustments for easy assembly and maintenance. You can just as easily assemble the Sanus Systems VMPL50A-B1 Visionmount Tilt Mount and place it with your TV for the ideal viewing experience as you can make adjustments and shifts for ideal placement of your TV. This best TV wall mount not only features a 12 degree virtual axis tilt, but it also consists of TV brackets that will snap into the right place on the wall plate for safety reasons. This TV wall mount is definitely one to consider as you will be astonished with its hardware capabilities and its solid wall mounted frame. Available at an extremely affordable price, the Sanus Systems VMPL50A-B1 Visionmount Tilt Mount won’t disappoint you with its rigid construction and solid handling. The Aeon Recessed Articulating In Wall TV Mount is a full motion TV wall mount of a muscular design that holds a TV of upto 135 pounds when fully extended at 28 inches. To ensure the current safety standards, it has also been tested and UL certified to withstand 540 pounds. This is a special kind of a TV wall mount as the recessed TV mount is hidden inside the wall for 37 to 70 inch TVs. The mount is positioned inside the wall between two 16 inch center studs for a complete recessed installation. The special attraction of this best TV wall mount is that even though it’s hidden inside the wall, with its innovative design structure, the mounted TV extends 28 inches away from the wall allowing a TV to turn 90 degrees sideways. It also consists of cable management controls that hides away all wires and cables. This TV wall mount surpasses technology as it can even handle some 80 inch TVs with decent level adjustments. It is built with heavy-graded steel to provide maximum safety and longevity. It comes with all mounting hardware controls and an instruction manual for you to assemble this beast effortlessly. With a universal mounting pattern, this mount tilts up and down to 15 degrees and it mounts flat panel screens as perfectly as curved back TVs. Similarly, another great feature of the Aeon Recessed Articulating In Wall TV Mount is that is features sturdy arms for corner applications or max pivot angle. Framing this TV wall mount as a powerful alternative at a relatively higher price is necessary for buyers looking for the best TV wall mount in many versatile categories. This one is our top pick for full motion TV wall mounts on the market to-day. It fits TVs with VESA mounting patterns from 50 x 50 to 750 x 450 and supports up to 175lbs. It’s got aluminum arms that make sure your TV is placed securely and safely for several years, even with maximum adjustments. This TV wall mount supports adjustments in three dimensions and can be stretched from a minimum distance to the wall of 5 to 20 inches perfectly. The Monoprice Full-Motion Wall Mount is adept to mount an LCD, LED, or Plasma display with defined VESA mounting patterns that is 32 to 60 inch TVs. It’s safe to say that this TV wall mount can be attached to any type of wall such as brick, concrete, wood stud, etc. and it can easily mount TVS up to 175lbs regardless of the wall construction. Even though this wall mount is slightly heavier than the rest, it can be singlehandedly assembled without any hassle; also, with this TV wall mount you get mounting hardware as well as a user’s manual that fastens the assembly process by hours! Monoprice’s products are constructed with quality and cold-formed steel for ultimate safety and reliability. It swivels +30 to -30 degrees and tilts from +5 to -15 degrees. It’s designed to provide the ultimate flexibility no matter where you choose to sit. The Monoprice Full-Motion Wall Mount is RoHS compliant with a strong safety standard, compatibility promise and extended warranty as well as a replacement warranty that grants users to get a full refund if they’re not completely satisfied with the product. The Full Motion TV Wall Mount With 32 inch Long Extension is our second best pick for a full motion TV wall mount. It features a long extension from 3.1 inches to 32 inches which is great for large TVs. It also accommodates 14 inches of horizontal adjustment to perfectly center the TV on the wall, cabinet or even a corner. Capable of mounting a 37 to 80 inch TV with a definite VESA mounting style, this best TV wall mount has a large opening in its back panel for cable entrances from the wall even. It ensures maximum adjustability with its dual stud construction that can hold up to 150 pounds even. This full motion TV wall mount pivots to a full 80 degrees without it hitting the wall at all and it also is a great fit for corner TVs as well as centered TVs that can be placed between studs. It doesn’t matter if you want to perfectly center your TV for a larger audience or you wish to slide the TV slightly to the left or right on the wall bracket for excellent picture quality, the Full Motion TV Wall Mount With 32 inch Long Extension can slide up to 14 inches on both sides to ensure smooth motility with no tools required. With up to 160 degrees of movement, your TV can be viewed at high standards from any angle. If you’re looking for something that’s solid to install, maintain and use for several years, this is the best TV wall mount for you. 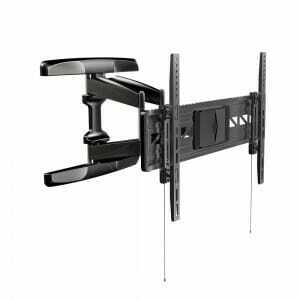 The VideoSecu Articulating TV Mount is one of the best TV wall mount models to purchase when hunting down ergonomic construction on the market. This is one considerably priced with excellent features that ensure proper safety and flexibility of your TV. This articulating TV mount has a retractable arm attached to the wall bracket; allowing wider motion range that grants the TV to be pulled away from wall and swiveled from left to right or right to left for multiple viewing angles. Similar to many existing articulating TV wall mounts on the market, the VideoSecu Articulating TV Mount is one that won’t disappoint you with its post-installation level adjustment that allows the TV to remain at the most perfect angle for satisfactory viewing. It features a heavy duty support display of up to 176 lbs with arm fold 2.75 inches or an extension of up to 25 inches. It fits all 60 to 80 inch displays with a universal mounting pattern from 200 x 200 to 930 x 640 (mm). You will find that this best TV wall mount allows 140 degree side-to-side swivel, 15 degree forward and backward tilt and a 25 inch pull from the wall to reduce glare. Its wall plate is 22.8 inches wide, which means that it’s to be mounted on two sturdy 16 inch studs upon assembly. If you’re worried about the assembly bit because of its heavy-duty construction, you’ll be relieved to know that it also consists of the standard mounting hardware required to do the assembly perfectly. It’s well-worth the price you pay for it online for being a strong and reliable articulating TV wall mount on the market. Another excellent pick for the best TV wall mount with a supreme articulating feature is the Kanto FMX3 Full Motion Articulating TV Wall Mount: it is a versatile TV wall mount which has an upper hand on its articulating motions capable of mounting flat panel TVs of 37 inch to 80 inch. It is pre-assembled with heavy-duty dual wishbone arms for maximum rearing and it can extend up to an incredible measure of 28 inch from the wall with up to 80 degree pan range as well as 15 degree vertical tilt for great elevation. It accommodates both 16 and 24 inch studs during assembly, which completely depends on the measures of your TV. It is an extremely versatile model to own that’s surprisingly marked down considering its unique features and reliable lifespan. You can easily assemble this best TV wall mount using the template supplied with the kit upon delivery. It holds firm levels even upon maximum extension from the wall with versatile adjustment levels throughout. You won’t find an articulating TV wall mount of such powerful dynamics at such an economical price on the market easily. This one is your safest and most perfect deal to steal for some serious sticklers. The ProMounts Wall Mount SFTL is our best tilt TV wall mount on the market because of many reasons: one of them being that it is a slim-mount with a 1 inch profile and second being that it is sturdy enough to handle 30 to 63 inch TVs that weigh up to 150 pounds. It is great for the perfectionist because it accommodates such diverse ranges that you can buy one and use for a lifetime with several different kinds and sizes of TVs over the years. It comes with a detailed installation user manual with all the different kinds of hardware tools you’ll need to get this mounted on the wall comfortably. It also specifies what you may require during assembly for different types of surfaces, just in case you’re looking for a versatile mount. Another great feature that escalates this best TV wall mount to the highest standards is that is allows users to adjust the TV horizontally on steel rails apart from tilting. With its EZ lock system, once you’ve found the ideal position for your TV, it locks the screen securely until adjusted later on. ProMounts offer great secure lock controls that on correct positioning it won’t budge at all. All-in-all, the ProMounts Wall Mount SFTL is a quality mount with specific powerful features to offer. The appealing parameter of this TV wall mount is its 0 to 15 degree up or down tilt additionally with its locking controls and horizontal adjustment capabilities. Our verdict of the OmniMount LIFT70 Tilt TV Wall Mount is that it’s an excellent, but expensive pick for many versatile purposes such as for gaming, TV viewing, and other entertainment experiences. This is a serious TV wall mount with many unique qualities, one of them being that it allows the user to install a TV on a wall at ‘couch height’ and raise it closer to standing height or even lower to use while sitting on the floor. It’s an amazingly constructed tilt TV wall mount with exceptionally dominating features beyond compare on the market to-day. The mount is very well built and has all the mounting hardware required for assembly. You can raise or lower it to a full 16 inches for multiple activities, you take your pick! You can even tilt your TV up to 10 degrees up or down to reduce glare or any other viewing disturbances. It can last you many years and doesn’t fail to impress with its unique adjustment capabilities. Our researchers can’t stress on its dominating feature enough for you to consider purchasing this if you’re someone who may require the TV for more than just standard viewing purposes. With its patented constant force technology, you only need to slightly touch to move. The OmniMount LIFT70 Tilt TV Wall Mount mounts TVs up to 46 to 65 inches and supports 45 to 70lbs weigh capacity. Suitable for all angles, this tilt TV wall mount is the best one on the market available to you at such a reasonable price and reliable warranty! Here you have the best TV wall mount: the Loctek R2L Curved TV Wall Mount with convincingly robust features, nothing short of an all-rounder. It seems that every day there is a new model that appears on the scene boasting its unique features, unmatchable price, and lifelong warranty in the world of TV mounts, but our recommendations are the few extraordinary ones from the lot. Similarly, with the increase in exposure of such models, we’ve come to realize the importance of mounting a TV on a wall mount for the ultimate viewing experience. We’ve compiled a promising list of several different kinds and types of TV wall mounts considering how particular a buyer must be to get what he/she wants. These selections will keep you on the right track towards purchasing the best TV wall mount with the perfect price, promising features and supreme warranty standards that are unique to each TV wall mount on the market.